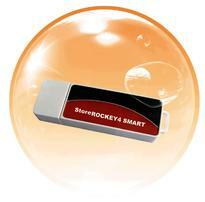 Store ROCKEY4 Smart comprises ROCKEY4 Smart software protection dongle with a Flash disk controller controlled mass capacity Flash disk. Software can be stored in the Flash disk and be protected by the dongle. Besides normal Flash disk, the device provides three special types of storage: A CDROM drive which supports auto-run feature, a hidden partition protected with user definable password and a secure partition protected by cryptographic encryption algorithm. As the CDROM drive supports auto-run function, after plug-in, the software can be installed and started automatically. It is no need for user to use CD or download the software any more. This can greatly reduce the maintenance cost and bring convenience to end users. The software is encrypted by the dongle, which ensure the software vendor's profit is well guarded. The hidden partition is the ideal place to store zero footprint programs. The sensitive user data can be stored in secure partition.